Very pleased with it, nice medium size and well made. The only thing is I wished it had a yellow color in it to match my ring. I liked it enough that I got one for a friend for her Birthday. Slowly wandering the tide pools of the vast oceans edge, the Starfish is a beautiful reminder of the diversity of life here on Earth. Its shape an inspiration, as its five tentacles reach out and stretch to experience all that life has to offer. This unique creature has inspired Thai artisan Goong to create this remarkable necklace. 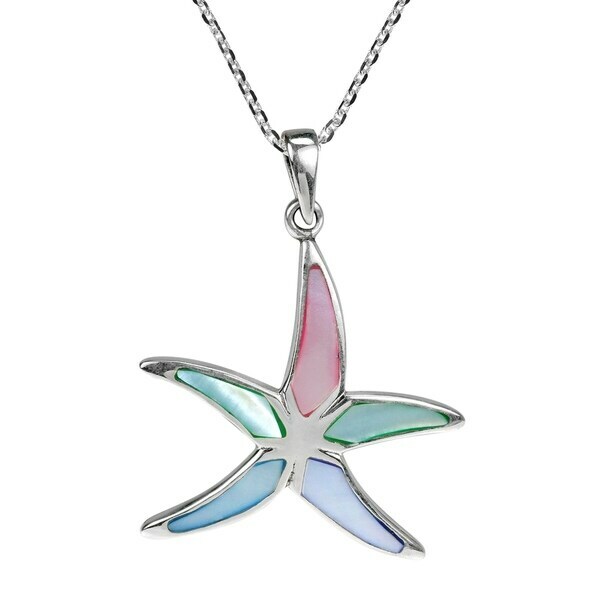 Handcrafted from sterling silver and accented with stone or mother of pearl inlays, this stunning necklace hangs on an 18-inch sterling silver cable chain and is finished with a spring ring closure. Great for all styles and outfits and perfect for everyday wear Please note that the pictures may not be true to scale, see dimension for the actual size. Goong worked very hard learning traditional embroidery, weaving and jewelry design. Her favorite was jewelry design because she loved how she could use native materials such as semi-precious stones and silver to create beautiful pieces. Goong worked hard honing this craft and she opened a small workshop where she could design and create silver jewelry. Goong's dream of owning her own business so she could provide for her family was finally coming true. Dimensions 1.42 In. X 1.18 In. X 18.0 In.